Mirthless is composing new songs into suicidal path. A Dirge For Your Suicide is the best analog sound on recording in the same professional studio. Our past releases was rough sound however, the mysticism is always the same way. Mirthless is a journey into the human subconscious with intense emotions. 5. Has the band done any live shows or is this strictly a studio band? Not live concerts but, Mirthless will play in live to spread rough emotions. 6. On a worldwide level how has the feedback been to your music by fans of doom metal? Mirthless were spread into underworld since demo debut by my label Doommaniac Productions. However some maniacs into doom metal are real extreme. Quality, not Quantity!!! 7. Are there any other musical projects going on these days? I am only dedicated to Mirthless but, our guitarist has his project called Hell Torment. Our path is bleak into obscure aura!!! 10. How would you describe your views on Occultism? I am not into occultism but, I respect some point of view into rituals, astrology and secrets of nature. Dark Occvlt Ritual are a 1 man band from Brazil that is a side project of the black metal band C.O.F.O.C with a musical style I would describe as being occult dark ritual ambient and this is a review of their 2013 album "Oro Per Nex" which was released by Black Evil Productions. Sound effects bring in elements of experimental, ritual, and dark ambient to create a sound of their own bring a dark occult ritual to the album and there are no other instruments present on this album. Vocals are all spoken word ritualistic passages along with some whispers that bring in some black metal elements, while the song themes cover Occultism, Rituals and Left hand Path practices, as for the production it has a very dark, raw and primitive sound with most of the songs being very long and epic in length. In my opinion Dark Occvlt Ritual are a very great sounding ritualistic, experimental, occult dark ambient project and if you are a fan of this musical genre, you should check out this recording. RECOMMENDED TRACKS INCLUDE "I" and "III". RECOMMENDED BUY. 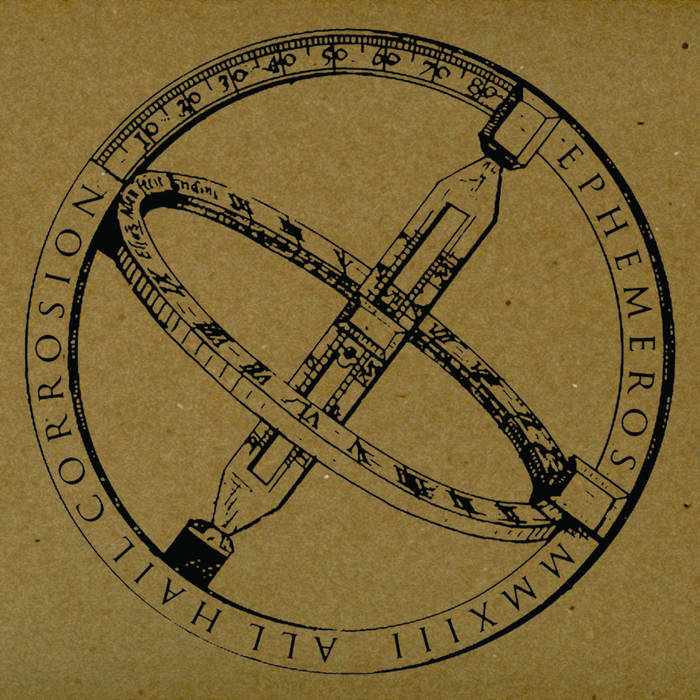 Ephemeros are a band from Portland Oregon this plays a very heavy and atmospheric form of funeral doom metal and this is a review of their 2013 album "All Hail Corrosion" which was released by Seventh Rule Recordings. Rhythm guitars range from slow to mid paced funeral doom metal riffs that are very heavy and dark sounding along with some melody and atmospheric clean playing being thrown into the riffing at times, while the lead guitars when they are utilized are very dark and melodic sounding doom metal guitar solos and leads. Vocals are mostly deep funeral doom/death metal growls with some high pitched screams that bring a black metal feeling to the recording, while the lyrics cover dark and depressive themes, as for the production it has a very strong, powerful, heavy and dark sound with the songs being long and epic in length. 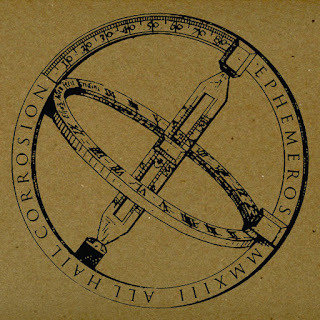 In my opinion Ephemeros are a very great sounding funeral doom metal band and if you are a fan of t his musical genre, you should check out this album. RECOMMENDED TRACK "Stillborn Workhouse". RECOMMENDED BUY. Born where a band from Milwaukee, Wisconsin that played electro-acoustic music with elements of stoner and doom metal and this is a review of their self titled and self released 2004 ep. Programming and fx's bring in elements of experimental, industrial, and avant garde to the music, while the acoustic guitars use finger picking and full chords to add psychedelic and folk elements to the recording while still being very experimental, along with some electric guitars being used at times which brings in the metal elements along with some solo's. Vocals range from spoken word parts to deep death metal growls and high pitched screams as well as some clean singing gothic vocals, while the lyrics cover violent and hateful themes, as for the production it has a very dark, heavy, raw and primitive sound to it. In my opinion Born where a very great sounding electro-acoustic, avant garde metal band and if you are a fan of this musical genre, you should check out this ep. RECOMMENDED TRACKS INCLUDE "Flowering Corpses" and "The World Is My Shotgun". RECOMMENDED BUY. Houses Of Thieves are a 1 man band from Milwaukee, Wisconsin that plays Psychedelic folk rock with elements of stoner and doom metal and this is a review of t heir self released 2001 demos. Synths bring a very psychedelic and 70's sound to the recording along with some drum's, while the acoustic guitars use finger picking and full chords to bring elements of folk, and 70's classic rock to the music with some stoner and doom metal influences. Vocals a re mostly clean singing with some spoken word parts being utilized at times, while the lyrics cover depressive and psychedelic themes, as for the production it has a very dark and old school 70's sound to it. In my opinion House Of Thieves are a very great sounding experimental, psychedelic folk rock band and if you are a fan of this musical genre, you should check out this demo compilation. RECOMMENDED TRACKS INCLUDE "Song For Kim" "Sadsong" and "Arabic Jam". RECOMMENDED BUY.